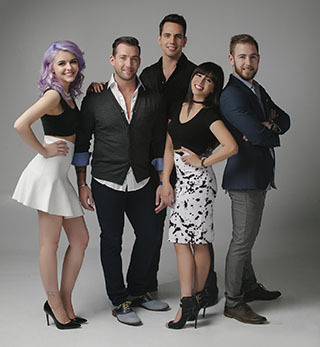 Aurora is a Vancouver based quintet featuring the vocal stylings of Cody Karey, DJ Calhoun, Jerrica Santos and Gabriela Geneva, under the masterful creativity of the award winning music director and pianist, Trevor Hoffmann. This group strives to create a vocal sound reminiscent of a complex a cappella group, but with the combined power of unique instrumentation supporting them. Their repertoire is mainly drawn from modern top 40 tunes,but they have no problem breathing new life into classics as well. The versatility of this group is what makes their performances so incredible, ranging from an intimate vocal solo with piano, to a rich 4 part vocal texture supported by full band and string orchestra. The will bring unforgettable entertainment to any audience. Noteable Entertainment & Events is a Vancouver based booking agency, party rental, entertainment services and event production company. If you are interested in booking Aurora please contact us.